Very familiar to most people as the capital of Turkey, Ankara is actually only the country's second-biggest city, being considerably smaller than Istanbul. 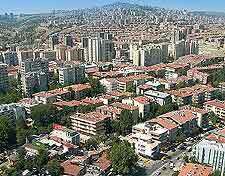 However, Ankara is actually a very large and presentable Turkish city, constantly expanding and offering a rather sophisticated and modern character. 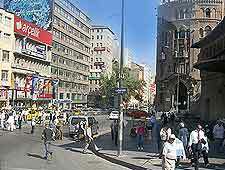 Many wide streets are now lined with coffee shops and eateries, particularly around the energetic Kizilay area. Various tourist hotspots present themselves around the city of Ankara and in particular, along the Ataturk Bulvari, which serves as a prominent artery. The Ulus Meydani, known simply as 'Ulus', is another important tourism hub in the city and this central square is close to a number of leading museums, while also offering a choice of accommodation and inexpensive restaurants. Nearby, the Ankara Tourist Information Office is easy to find and stands directly opposite the Maltepe Akaray Train Station, on the Gazi Mustafa Kemal Bulvari. Although Ankara is somewhat overshadowed by the enormous Turkish city of Istanbul, but really does compete well in the way of quality tourist attractions. The city's Citadel walls are positively ancient and comprise a mixture of different architectural styles through the ages. Also of a great age and much visited are the Roman Baths of Ankara, which remain is a good state of repair, considering that they are more than 1,700 years old. The Ataturk Mausoleum is yet another major sight, while for families, the attractions within the Ataturk Forest Farm and Zoo and Aquapark Club Watercity comes highly recommended. 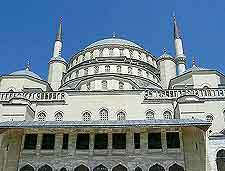 More information about Ankara Tourist Attractions. Head to the Old Town 'Ulus' area of Ankara to find the most historical landmarks and imposing mosques. These include both the Lion's Den Mosque (Aslanhane Camii) and the Yeni Mosque (Cenab Ahmet Pasa Camii), with the ancient Column of Julian (Queen of Sheba Monument) also standing within this part of the city. For the best views of Ankara, head to the Cankaya area and climb to the top of the Atakule Tower, where the panoramas are quite unbeatable. For something a little newer but just as impressive, take time out to pay a visit to the very beautiful Kocatepe Mosque, which immediately became the city's biggest mosque when it was completed in the late 1980s. 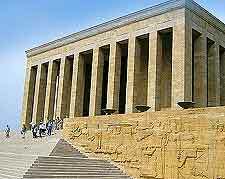 More information about Ankara Landmarks and Monuments. There are several very notable museums to be found within Ankara, offering a broad spectrum of information on a range of different topics, including the city's rich Ottoman history and even the founder of the Republic of Turkey himself, Mustafa Kemal Ataturk. The award-winning Museum of Anatolian Civilisations should certainly feature at the top of any sightseeing itinerary, along with the Ankara Ethnography Museum. Close to the Tandogan Kapali Carsi shopping district, the vintage engines and trains displayed within the Open-Air Steam Locomotive Museum may also be of interest. 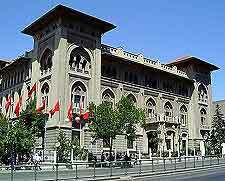 More information about Ankara Museums. If you are planning to head outside of Ankara and looking for possible day trips, then you will be pleased to find endless appealing Turkish delights within easy reach of the city itself. Many will favour excursions to the historical town of Beypazari or to the city of Antalya, which stands alongside the Mediterranean coastline and is almost overflowing with characterful mosques. For something very different and quite extraordinary, be sure to check out the unique, moon-like rock formations of Cappadocia. However, the allure of Istanbul is quite undeniable, although at around 350 km / 217 miles to the north-west, it is a little too far for a day trip and certainly deserves a longer excursion. Tourists able to visit Istanbul will no doubt be overwhelmed by its Grand Bazaar, where in excess of 6,000 different shops attract some 400,000 keen shoppers - each day. 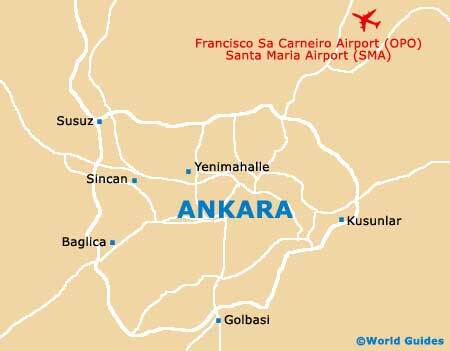 More information about Ankara Attractions Nearby.